Some of the most famous cliff dwellings are those in North America, particularly among the canyons of the southwest, in Arizona, New Mexico, Utah, Colorado and Chihuahua in Mexico, some of which are still used by Native Americans. There has been considerable discussion as to their antiquity, but modern research finds no definite justification for assigning them to a distinct primitive race, or farther back than the ancestors of the modern Pueblo people. The area in which they occur coincides with that in which other traces of the Pueblo tribes have been found. The niches that were used are often of considerable size, occurring in cliffs to a thousand feet in height, and approached by rock steps or log ladders. This article incorporates text from a publication now in the public domain: Chisholm, Hugh, ed. (1911). "Cliff-dwellings". Encyclopædia Britannica. 6 (11th ed.). Cambridge University Press. p. 507. 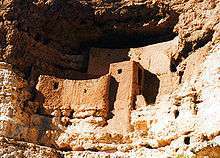 Wikimedia Commons has media related to Cliff dwellings.